We researched and implemented a range of advanced rendering effects in collaboration with LEGO. On concrete result of the investigation is the Screen Space Directional Occlusion implemented in Lego Digital Designer. Both ambient-occlusion and color bleeding are difficult to achieve in interactive products such as LEGO Digital Designer. They are simply too advanced and therefore too slow to calculate and display. This problem was solved by processing ambient occlusion (for soft shadows) and local colored reflections as a post-processing effect in screen space. This meant that these effects were calculated on a rough approximation of the actual 3D scene, namely pixels with depth. But the effect is almost as good as the “real” effect – and much faster. The effect is called “Screen Space Directional Occlusion” (SSDO). We also investigated high quality anti-aliasing, realtime raytracing and more accurate reflections in realtime. 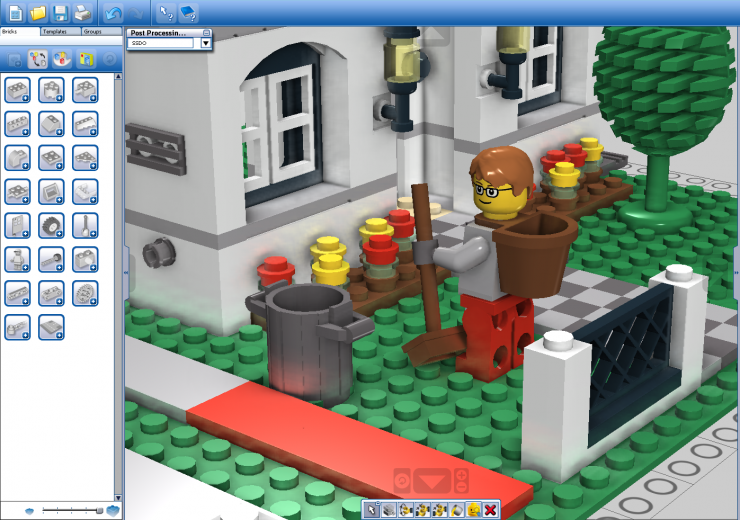 The SSDO was been implemented in LEGO Digital Designer 4.0.